“We wouldn’t do it!” — that’s the thought many tourists get when they visit China. The main attraction of the country is its residents — with their own traditions, rules, and sometimes funny habits. This article will tell you about interesting events and even shocking things that occasionally take place in this country. Bright Side collected 22 strange and fascinating Chinese oddities for you and even tried to explain them. 1. In China, you can take part in competitions where people must eat chili peppers while submerged in a pool of them. We hope that the fight is worth the prize. 2. Have we already mentioned that the population of China is huge? Here is a photo from a Chinese resort. 3. Carrying fish in the hollows of the clavicles is a popular trend in China for girls to show how skinny they are. 4. 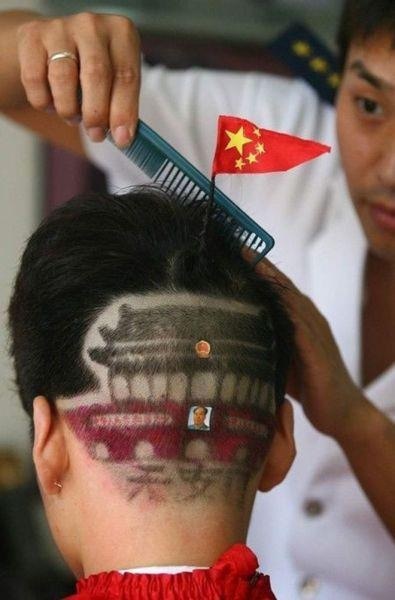 Barbers use their imagination to the fullest. 5. If you want to relax, you don't need to go to a spa. You can find a masseuse everywhere. 6. Team exercises in the open air help Chinese people stay in good shape. 7. China is the king of fakes and it never ceases to amaze us with its creativity. 8. If you get a manicure there, every finger should shine. 9. After a hard work week, many Chinese people put on pajamas and wear them until Monday. It's called 'weekend' mode and it includes going out, shopping, and dining at restaurants. 10. Chinese people always carry a thermos with hot water with them. Drinking hot water helps prevent many diseases. What if you get sick? Drink water! 11. Very few people care about comfort in China. You can buy a ticket without a seat, even on a long-distance train. 12. Their street food is very exotic. Would you like a scorpion on a stick? 13. Beans are highly respected in the Chinese culture. An ice cream made of peas is almost considered a national treat. 14. This is the reaction of Chinese people to blue-eyed blondes. 15. Even a dark-haired European can feel like a star here. 16. Road traffic in China is a whole new universe with its own rules that can hardly be understood by foreigners. 17. Many residents of China have to wear medical masks due to over-polluted air. In order to make it look nice, they turned these masks into a really trendy accessory. 18. Having "vampire" teeth is an unusual trend that many Asian people like. If nature hasn't provided you with sharp fangs, you can easily correct that at a dentist office. Chinese girls believe that these teeth help them to resemble cats. 19. They get very tired in their daily life and that's why they can easily fall asleep at any moment, in any place. If you ever visit China, it will give you a long-lasting feeling of visiting another planet. Would you like to visit this country and experience everything yourself? Please tell us about it in the comments!